Located within India's vast state of Delhi, the city of New Delhi is a true bustling metropolis, filled with exciting sounds and smells. 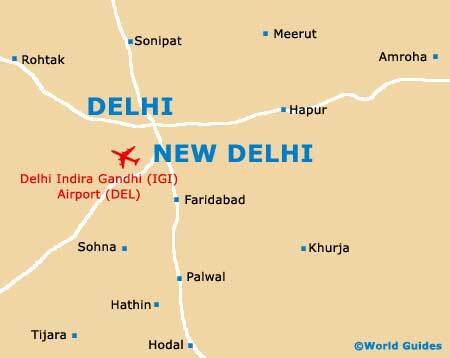 The much-loved capital city of the Republic of India, New Delhi is originally built by the British to be the capital of India, while nearby Old Delhi, known locally as Shahjahanabad, was Islamic India's capital city. 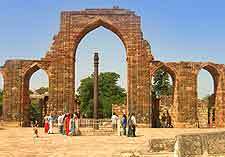 Delhi itself is steeped in history, being thought to date back some 5,000 years. Therefore, tourists exploring the region can expect to enjoy a host of ancient temples, shrines and buildings. Plenty of historic structures reside in New Delhi, along with many highly acclaimed modern buildings, and these can all often be enjoyed whilst whizzing around in one of the city's famous three-wheeled auto rickshaws. Tourists visiting New Delhi should always look out for the colourful spices and jewellery at the area's lively bazaars, along with 'squiggles', a tasty deep-fried sweet. For tourism advice, the India Tourism Delhi (Government of India Tourist Office) is an official outlet and amongst the best on offer and full of tourism advice. However, there are a number of sub-standard, somewhat profit-driven travel agencies and tourist information offices around New Delhi worth avoiding. Tourist attractions abound around New Delhi, with many people choosing to sightsee from a hot-air balloon, with regular rides operated by the Balloon Club of India. For children and families, New Delhi has much to offer, with highlights including the National Zoological Park (NZP), home to everything from animals to trolley rides. Also look out for Appu Ghar, a top amusement park featuring thrilling rides and roller coasters, and also the enormous Asola Wildlife Sanctuary, on the south-eastern side of New Delhi. Next to the Santushti Shopping Centre, Nehru Park is a great place for recreational activities and hosts many open-air concerts and events. 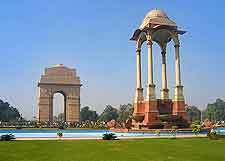 More information about New Delhi Tourist Attractions. A historical city full of grand landmarks from days gone by, New Delhi's most notable structures include the war memorial of India Gate, the magnificent Lotus Temple and its breathtaking petal-inspired roof, and also both the magnificent Sansad Bhavan (Parliament House) and Rashtrapati Bhavan (President House), the official residence of India's president. 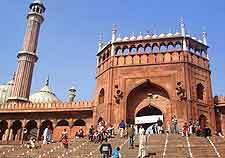 Particularly famous is New Delhi's 17th-century Jama Masjid mosque, and the iconic, hard-to-miss Red Fort (Lal Qila), where regular 'Sound and Light' shows are held. More information about New Delhi Landmarks. Those looking to explore the past will find that New Delhi has plenty of museums on offer, such as the Mahatma Gandhi National Museum, the National Museum of Natural History, and also the National Museum, where you will discover plenty of information about this urban metropolis. Art aficionados will enjoy New Delhi's main art galleries, which include a host of paintings at the National Gallery of Modern Art (NGMA) and also the National Academy of Art. For themed events and visiting art exhibitions, the India International Centre (IIC) is a major venue and also hosts various theatrical performances. More information about New Delhi Museums and New Delhi Art Galleries. Close to New Delhi, the city of Faridabad is a worthwhile excursion and home to a number of lively tourist complexes and also the beautiful Raja Nahar Singh Palace. Also nearby Delhi is a thriving pottery industry within Bulandshahr, many superb shopping malls at Gurgaon, and the numerous historic shrines and temples at both Rohtak and Meerut. 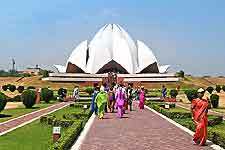 More information about New Delhi Attractions Nearby.